There is a kind of buzz at Amrut yet again. This time ita��s their 21st variant called The Spectrum. Only five barrels of this whisky have been made and already been sold at GBP 100 a pop. Not bad, you might say if you are an Amrut Fan. But try getting hold of one. Even, I daresay, if you are world famous whisky critic Jim Murray, who has done his share of raving about the brand, after naming it the third best whisky in the world in his Whisky Bible 2010. I chatted on the phone with Trivikram Nikam, son-in-law of Amrut owner NR Jagdale, and director of marketing in the company. 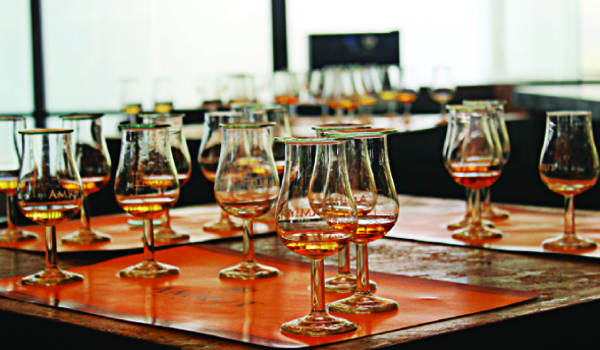 Amrut prides itself on being a boutique company, and every whisky by them has been quirkily named. a�?We keep thinking of new stuff, always looking to add some excitement,a�? says Nikam of the small family run company. They are a very tightly knit group, either travelling around the world on work in a way that would put Gulliver to shame, or heading off to Ooty to play golf on a family break. So what is the idea behind Spectrum, a 50% abv (alcohol by volume) whisky? The James Bond styled name apart, this one is a historical first in the annals of whisky making in the entire world, Nikam tell me. For Spectrum they wanted to experiment with well, a spectrum of flavours and add layers of complexity to the whisky. So they took five different barrels of different woods a�� new American Oak, new French Oak, new Spanish Oak, ex-PX sherry cask and an ex-Olorosso sherry cask, and took them apart before they put them together again. This time, they mixed the staves up so each of the five was present in each barrel a�� a kind of 5-in-one affair. The whisky was matured in these unique barrels for three and a half years. a�?The whiskya��s complexity is beautiful,a�? admits Vikram, a�?Though we honestly didna��t know how it would turn out when we started on it. Ita��s never been done before.a�? To add to the mystery, no tasting notes are attached with the bottle. The consumer, felt the Amrut gang, had to decide for themselves. But sadly for Indian Amrut fans, they will have to travel far and wide in search of this one. Allocations have been snapped up in Europe, Australia, New Zealand, Taiwan and Canada a�� all pre-sold just through word of mouth. It will not be launched in India now. With only 1,000 bottles in the market, this one might end up a bigger hit than their a�?Greedy Angelsa�� or a�?Naarangia�� (told you about the quirky names). A focused tasting was done to test the waters in Malmo, Sweden, with the Biskopen Gustavs Maltklubb. Needless to say, they got thumbs up. Another fun fact: the whisky was launched in a poster featuring senior general manager Ashok Chokalingam (whoa��s also dreamt up the most of the Amrut whisky names over the years) in true Bond style a�� tuxedo, Bond-like stance etc. Only he had a bottle of whisky in place of a Walther PPK.